On Friday, July 15, a group of us visiting from the University of Arizona awoke before dawn to a muzzle of fog settling over Grand Manan. We headed for Seal Cove, to a boat, Island Bound, where Russell Ingalls and Mark Morse would steam a small group out the Kent Island. Aboard, there was a group from the Bowdoin College Scientific Research Station, a couple of tourists, islanders Liam Watkins and Delaney Ingersoll, Peter Cunningham, his partner Ara Fitzgerald, and their friend Paul Kaiser from away. Some of those on the boat had clear interests in Kent Island—research, birds, flora—but for others on the boat, interest in the island dates back almost a century, through the tendrils of a bloodline rooted deep in the heart of that small, cloudy island. When Peter Cunningham arrived at the dock he propped his hand out to everyone he didn’t know, introduced himself, and then said hi to his already familiar acquaintances. He’s magnanimous and kind, playful in his conversations, and manages to elicit a thoughtful response from anyone who engages. He’s observant and curious, and these are perhaps his most useful traits as a career photographer. On the boat he shows me a new belt holster he got for his camera that he explains makes it much easier for him to tag along the device without the discomfort a neck strap causes. 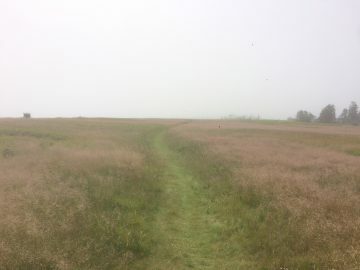 It might seem strange that Peter chose photography as an art and occupation, given that his father, Bob Cunningham, was a long time cloud physicist and meteorologist who performed a fog and atmospheric study on Kent Island for 70 years. Peter Cunningham chatting with Delaney Ingalls and Peyton Stark on the Island Bound. I never had the pleasure of meeting Bob, but I have heard some of his stories. 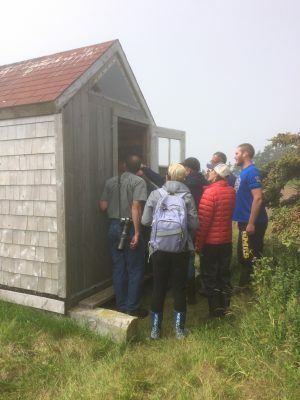 On Kent, there is a small 8’x6’ shack, aptly named Fog Heaven, that was built specifically for Bob so that he could stop propping his instruments in the field under a thin tarp draped over drift wood, and sealed at the seams with tar. His curiosity was immense, like his son’s, and Bob couldn’t hide it behind the toothy grin he bares in every photo I’ve seen. 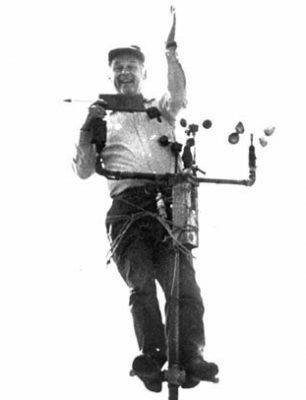 In one he’s atop a thin aluminum pole secured to a roof with thin wire, fixing an anemometer, his grin intact, flying one hand at the camera in the undoubtedly chilled air, a ball cap draped on his head. In another, he’s above the cockpit on an old World War II plane securing instruments. He worked all over the world, with numerous companies and organizations, after graduating from MIT, that he might understand the most basic entity of survival: Air. The group looking in on Fog Heaven. Since the advent of the Industrial Revolution until mid-century, the United States was free to burn coal and wood at factories, send plumes of smoke and steam into the atmosphere with impunity. This was a much different time, I don’t have to tell you, when we didn’t understand that everything in this world is one organism exchanging particles and particulates with other single entities. We didn’t understand global warming, and only had a vague idea about weather patterns and the dissemination of harmful chemicals on winds. I imagine some scientists, and the average citizen gazed into the clear, blue sky and didn’t put stock in what exactly they couldn’t see. This, however, was not Bob Cunningham’s position. Bob was prophetic in his vision as he was inspired in his claims. After his years at MIT, Bob worked for Air Force Cambridge Research Labs to study the effects of flying through rough weather. He and his crew lit out nose first into hail and thunderstorms. Bob mounted probes on their plane to attract lightning. Their weather-hardened C-130 and its crew earned the nickname, “Cunningham’s Roughriders” and the insignia was painted on the side of the plane. After the AFCRL, Bob directed scientists from all over the world for the UN’s World Meteorological Organization. He traveled the world extensively and studied cloud physics, cloud seeding and precipitation enhancement in every type of climate. All the while he maintained collecting fog and weather samples from Kent Island. So Bob studied fog on Kent Island. For seventy years. Structures were built on Kent to perform the studies. Where once Bob and his colleagues used large steel drums to capture fog, later there were nets that drain the saturated air into graduated containers. 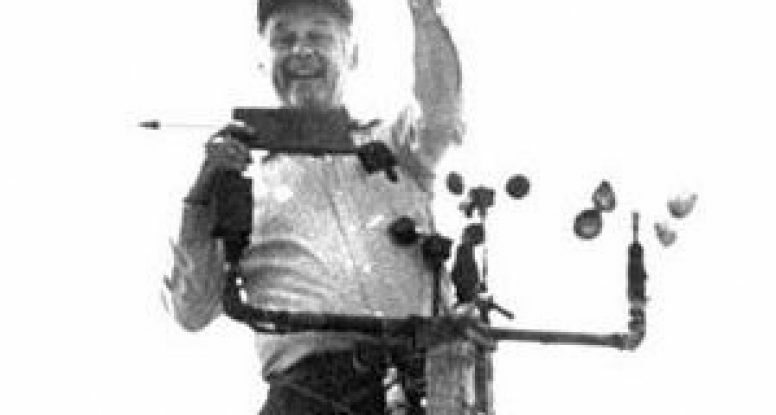 And still atop the radio shack, near where Bob’s cabin stands, an anemometer spins in the gusts and gales. To say that Bob’s studies on Kent Island were impressive would be an understatement. His work there may be the single longest, continuous scientific study by one person working in one place. Ever. This alone is worthy of tribute. But for Bob, that study and his work out there meant something. And while recording information is useful, its interpretation is key. Bob saw something in the air that you and I can’t. It was clear it was there because over on Grand Manan trees were stripped of leaves and ground vegetation couldn’t thrive. What Bob discovered was that factories in the Mid-west were dumping particulates in the air that were catching a ride on the jet stream and dumping acid rain on the northeast. This discovery, as would be later noted by President Lyndon B. Johnson, was absolutely integral to passing the Clean Air Act of 1963. Not only did this new law force regulations on the factories in the Mid-west, this began a long history of citizens fighting for environmental rights, air quality, and higher emission standards that are still applicable, and improved upon today. From that boggy little island just a few miles southeast of Grand Manan, Bob Cunningham veritably changed the world, forever. Bob “Fogseeker” Cunningham fixing the anemometers. Bob fascinates me because Bob is fascinating. Peter intrigues me because he’s kind and talented and goads conversations with innocuous, playful tactics. I can see his charm in every one of his father’s photos, in that smile. But this is not the only time when photography and cloud physics overlap. A photograph records a moment in time on the infinite spectrum of before and after. In that small segment of recorded data, reproduced as an image, there is a multitude of stories, and my guess is that Peter knows the stories behind every one of his photos. He points and snaps, shutters a bit of light to record and memory. And then that experience is opened up to endless translation and human understanding. In this way photography is a language as universal as mathematics and as applicable as any science. While all those years, in front of all those instruments, Bob was there recording other moments of time, noting the numbers, calculating their relevance, and translating their patterns into a language the rest of us might understand: love and human preservation. It obvious to assume that interest is the foundation of love. Thus, Bob’s interest was in documenting the sky and this can be interpreted into a love for humanity. That is a kind of generosity and pureness of spirit I can only imagine, and one, on the daily, I try to assume. It’s no wonder that Peter is a Buddhist who finds such genuine pleasure in observing and interacting with the people and landscape of this place, that his favorite walk on earth is on Kent Island, through a field of thigh-high grass and wind-stripped conifers to the south shore where the breakers roar on the tempestuous tide. It’s no wonder that he chose to record data, much like his father, and it’s no wonder that his quiet and modest expression holds all the love and spirit of his father. Last Friday, Peter took his favorite walk with his partner Ara. As he returned he stopped to see his father who still remains on the island, even after his death in 2008. Before catching the boat home, Peter opened the door to the Fog Heaven where his father slept and studied, where Bob’s ashes still remain. Peter took the hat he was wearing off his head and exchanged it for one resting on the box and said, “Thanks for the hat, Dad.” He turned around, smiling, and walked out the door toward the dock. The walk, headed south, on Kent Island.